Background: Recent patents reveal that vegetable ingredients have several applications in novel food formulations. Many so-called antinutritional components (e.g. tannins, saponins, lectins and protease inhibitors) have nutraceutical as well as pharmaceutical significance. Seeds of two wild legumes of the genus Canavalia inhabitants of the coastal sand dunes of Southwest India are known for a variety of bioactive principles (e.g. phenolics, tannins, canavanine, concanavalin and phytohemagglutinins). Objective: This study evaluates the impact of Electron Beam (EB) irradiation on the bioactive components of seeds of two coastal sand dune wild legumes Canavalia cathartica and C. maritima. Methods: The dry seeds of C. cathartica and C. maritima were EB irradiated with different doses (2.5, 5, 10 and 15 kGy) to follow changes in six bioactive principles (total phenolics, orthodihydric phenols, tannins, canavanine, trypsin inhibitors and phytohemagglutinins) in comparison to control seeds. 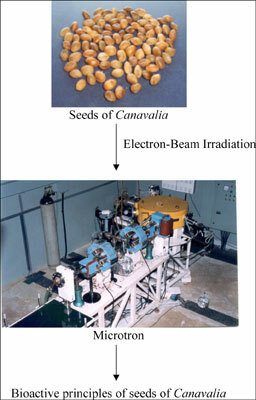 One-way ANOVA was employed to follow the variation in bioactive components of seeds in control and different doses of irradiation. Results: Seeds of both legumes were devoid of orthodihydric phenols and trypsin inhibitors. In C. cathartica, the total phenolics showed significant dose-dependent increase up to 5 kGy and decreased thereafter. Tannin content was not altered up to 10 kGy followed by significant decrease at 15 kGy. There was no significant change in canavanine content and the phytohemagglutinin activity against human erythrocytes was not altered. Seeds of C. maritima did not show significant changes in total phenolics as well as tannin contents. The content of canavanine showed significant dose-dependent increase up to 5 kGy followed by significant decrease. There was no variation in phytohemagglutinin activity against erythrocytes A, B and O, while against AB, the activity decreased at 2.5 kGy and further decrease was constant at higher doses. Conclusion: The EB irradiation doses employed have selectively altered the bioactive principles of Canavalia seeds and such treatments may facilitate to maneuver desired medicinal, nutritional, functional and cooking properties. Besides selective changes in bioactive components the seeds have extended shelf life. Canavanine, hemagglutinin, phenolics, seeds, trypsin inhibition, wild legumes.